Image caption Nikolai Valuev is joining the expedition looking for the "Siberian Snowman"
At seven feet tall (2.13m) and 23 stone (146kg), Valuev was the tallest and the heaviest boxing champion in history. The man called the "Beast from the East" is in Siberia to track down another beast, the yeti. There are said to have been several sightings in the mountains of Kemerovo Region in recent years. In 2009, local hunters witnessed what they described as "hairy humanoid creatures" near the Azass Cave in Mount Shoriya. The creatures were said to be about six feet tall. 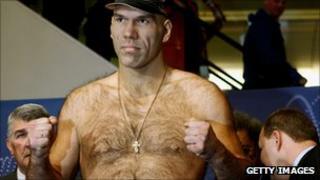 Veritable midgets compared to Mr Valuev. But big enough, and mysterious enough, to be dubbed the "Siberian Snowman". It's a story which has captured the boxer's imagination - but does he really believe he'll bump into bigfoot? "I'm only going to be here for two days, " Nikolai said on a crackly mobile phone connection from the expedition convoy. Media captionNikolai Valuev tells the BBC's Steve Rosenberg that finding a Yeti would be "a miracle"
"And I believe that miracles only happen at Christmas time. I doubt whether the yeti is going to run into the road and greet our truck with open arms. But I'll let you know if I see anything." A spokesman for the Kemerovo regional administration said that the boxer was keen to "talk to the yeti about life". That may prove difficult. This isn't the first expedition to look for Siberian snowmen. A number of scientists in Kemerovo have been exploring the region, searching for large footprints and other signs of yeti life. There are plans for a Yeti Institute and an international Yeti Conference. And what about Nikolai Valuev's own plans, once this expedition is over? He retired following the loss of his WBA crown to Britain's David Haye. Is he considering a return to the ring? "I've been thinking about that, " Nikolai told me, "But I don't want to make any announcements yet." For now, he's focused on finding himself a yeti. It's bigfoot before boxing.